The HeRO Graft is made up of two components that are implanted completely under your skin. During surgery, a reinforced tube (called the Venous Outflow Component) is inserted directly into a large vein in the neck. The doctor uses x-rays to direct the tube past any blockages that have been causing trouble for your other accesses. The second component is a regular dialysis graft that the doctor sews to an artery, just like others you may have. The graft is then joined to the outflow component with a special connector. 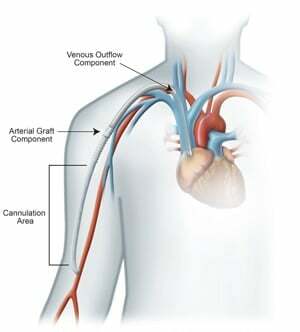 Once the whole system is in place, your blood will start flowing from the artery through the graft and the outflow component into your heart. You have continuous blood flow even when you’re not receiving dialysis. When your doctor says it’s ready, HeRO Graft cannulation technique is just like a regular graft, so your dialysis team will not require any special training.